N.B. : I used a little Latin to spare you the defendant list. I can spare you the decision itself, too. It’s just a variation on the argument that has been made since the very first constitutional challenge to “In God We Trust,” Aronow v. United States (1970): the motto simply doesn’t have much to do with God. “It’s quite obvious,” opines the majority in Aronow, “that ‘In God We Trust’ has nothing whatsoever to do with the establishment of religion. Its use is of patriotic or ceremonial character . . . [with] no theological or ritualistic impact.” It’s “lost through rote repetition any significant religious content” (Lynch v. Donnelly, 1984). As O’Hair v. Blumenthal (1978) puts it (summarizing Aronow), “the primary purpose of the slogan was secular; it served a secular ceremonial purpose in the obviously secular function of providing a medium of exchange.” It’s not about God per se, so much as “the Government’s legitimate goal of honoring religion’s role in American life and in the protection of fundamental rights” (New Doe Child #1 v. U.S.) Et cetera. In other words, “In God We Trust” is perfectly constitutional because . . . it doesn’t mean what it says. God knows I sometimes forget that “God” means God too. Theism—especially the Christian variety—pervades American discourse so thoroughly we sometimes don’t even notice it. 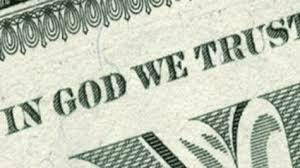 I’m an atheist and even I don’t generally think about the significance of “In God We Trust” on the dollar bill any more than I do that weird pyramid thing with the eyeball. Even worse, I sometimes forget our government is supposed to be religion-free. Back in June when Attorney General Jeff Sessions excused the separation of families at the border by citing Romans 13:1 (the Apostle Paul’s command to obey authorities), I was disgusted by the use of the New Testament to defend something so patently, well, un-Christian, and later thrilled when Stephen Colbert responded in his monologue with Romans 13:10 (“ . . . therefore love is the law”). So happy was I to see a good Christian with a good Bible quote vanquish a bad Christian with a bad one, I completely forgot the Bible shouldn’t have anything to do with the matter. It’s like a smell that sticks around so long you don’t smell it anymore. But it’s there, trust me. In fact, a slew of states recently passed laws requiring the posting of “In God We Trust” in schools because . . . it’s patriotic, secular, and has no religious content? Nope. Because “God” means God. In Florida, Representative Kimberly Daniels introduced the bill on the House floor this way: God isn’t “Republican and he’s not a Democrat,” she said. “He’s not black and he’s not white. He is the light. And our schools need light in them like never before.” This was nine days after the shooting at Marjory Stoneman Douglas High School and one day after the House had failed to advance a bill banning assault weapons. There you have it. If God is touted as the solution to the Parkland massacre, “In God We Trust” is not only (pace legal precedent) a sincere expression of belief in God, but also a compelling argument for getting God out of the public discourse. As long as He’s in the way, we’re not going to get much done. But each ruling that comes down stacks the odds ever higher against atheists and others who prefer to keep state separate from church. New Doe Child # 1 v. United States alone cites four dozen cases as precedent. And now it too will take its place alongside its forebears, buttressing the constitutionality of “In God We Trust” by repetition and tradition and yet more precedent. Reason v. Tradition is a tough case to win. Still, I find hope in New Doe Child #1 v. United States. Not in the decision itself, but in that comically long list of plaintiffs. Take another look. Along with eight other anonymous children, New Doe Child #1 is being raised as an atheist. Not just an atheist—an activist. Which means she’ll probably raise her own kids that way, and maybe their kids or their kids will manage to get elected to school boards and state legislatures and Congress despite their manifest failure to place their trust in a supreme being. And maybe then when the question of the national motto comes up, “In God We Trust” will go down. It’s a long way off, I know. But if those of us who don’t believe in God raise our children as atheists—if we set that precedent—there’s hope. New Doe Child #1, I’m counting on you. Because you see hope in this (New Doe Child #1, etc. ), I choose to also. But don’t read Paul Theroux’s *Deep South,* or hope may vanish. Damn it.